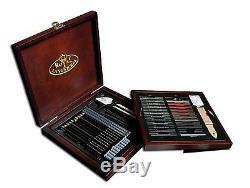 Royal & Langnickel Premier Sketch Pencil Art Set, 51-Piece. Model RSET SKET1600 is a collection of premium sketching materials. Quality Essentials branded product in dark-toned wood case. Includes 12 graphite pencils, 12 compressed color sticks, 12 sketching sticks, 4-piece vine charcoal, 3 charcoal pencils, 2 blending stumps. 1 Sharpener, 1 sandpaper block, 1 knead able eraser, 1 drawing eraser. 1 Rich, dark-tone wood case with nesting trays, hinged lid and metal hasp closure. The Royal & Langnickel Premier Box Sets are extensive collections of fine art materials in stunning dark-toned wood cases. The fine quality art products included in the assortments are organized in trays that are nested in the hardwood case with hinged lid and metal hasp closure. These sets exude quality and make a terrific gift for anyone interested in art. You may return items in its original condition within 30 days. The item "Royal & Langnickel Premier Sketch Pencil Art Set 51-Piece" is in sale since Friday, August 05, 2016. This item is in the category "Crafts\Art Supplies\Drawing & Lettering Supplies\Art Pencils & Charcoal".